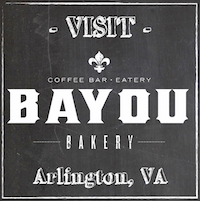 Every Wednesday, Bayou Bakery pays homage to Chef David Guas' Cuban heritage with Cuban special menu items! The menu features a Pressed Cubano sandwich filled with an authentic combination of Roasted Pork, Sliced Ham, Swiss Cheese, Pickles, and Yellow Mustard. Try our Pastelitos con Carne, made with Ground Beef, Ground Chorizo, Olives, Raisins, and Spices, or the Picadillo with Sweet Plantains and Yucca con Mojo! Not for the faint of heart, our Cortadito espresso drink is as potent as the one you'll find in Cuba. Experience the flavors and dishes that cultivated Chef Guas' personal cooking style!